Buddha bowl…grain bowl….tomato….toh-mato…tasty. Whatever name you give these guys, it’s all good in my book as long as you’re partaking in this flavor experience. 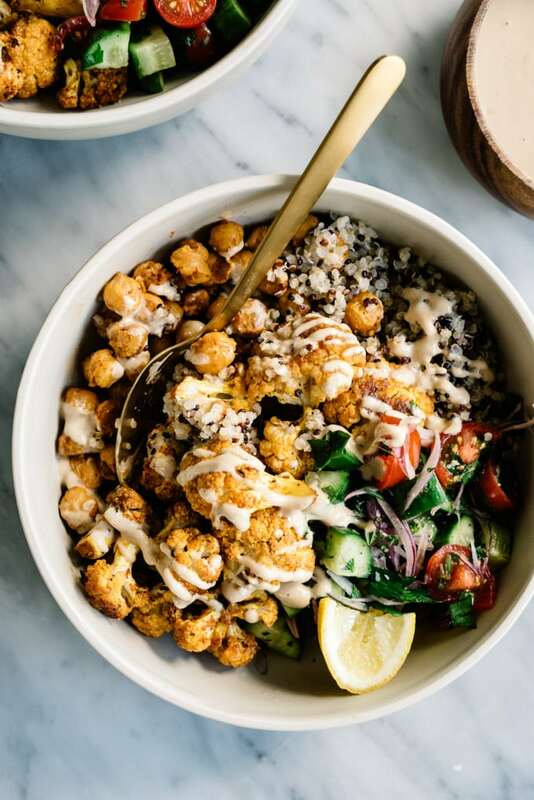 Because let me tell you, this cauliflower shawarma bowl has got it ALL going on. Spicy, hot, sweet, tangy, herby – it’s a perfectly balanced vegan and gluten free flavor bomb that you need in your belly, stat. 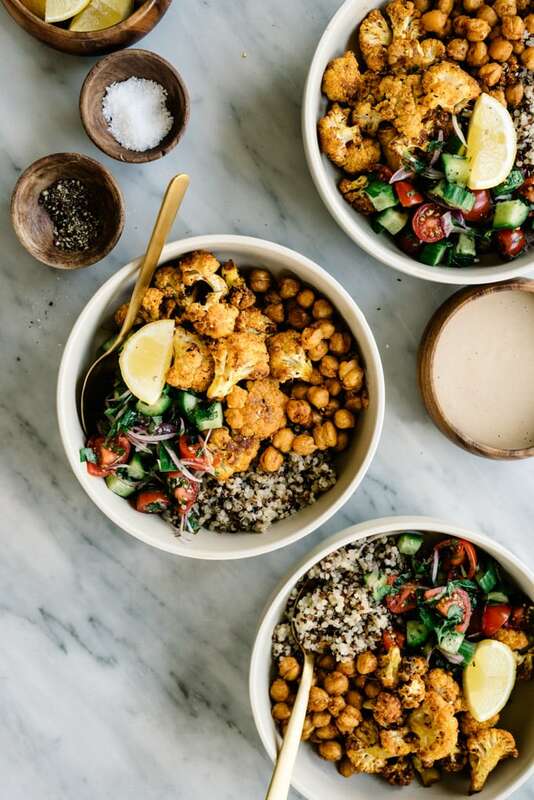 Buddha bowls speak my foodie love language – little bits of this and that with some spice, some crunch, lots of veggies, smothered with a finger-licking sauce that ties it all together. LOVE. and tangy, creamy tahini dressing cuts through the spice and heat – hello balanced flavors! 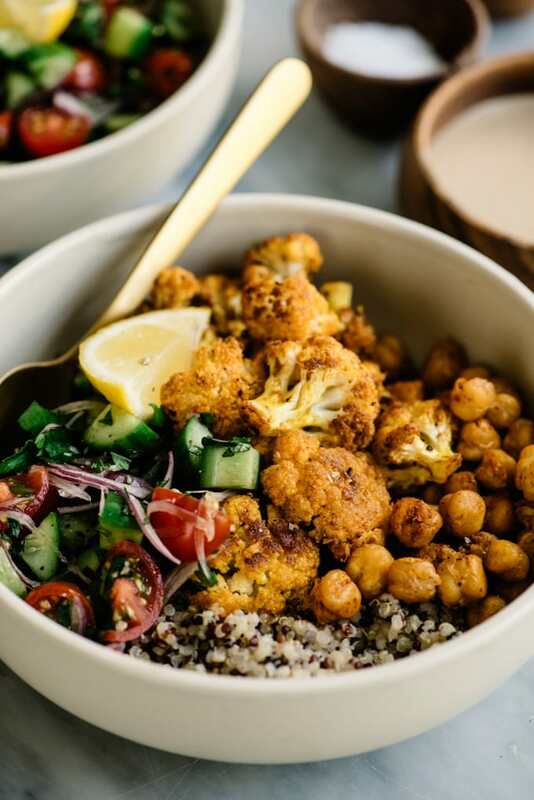 What might be even BETTER news than the perfect flavor balance happening in this cauliflower shawarma situation is that this bowl is totally meal prep friendly. Happy, healthy lunchtime vibes (or dinner vibes, it’s all good) are calling your name! >>> Pin it now! Click here to save this Vegan Shawarma Bowl to your vegan recipes board on Pinterest. Please don’t be intimated by the recipe length. This vegan shawarma bowl is super duper easy, but it does take a few steps to get there. Fair warning that you’re gonna have some dishes. Sometimes it’s the price you pay for flavor friends. Shall we get to it? Mix together the shawarma seasoning in a small bowl. This particular blend is definitely hot-spicy, so adjust the red pepper flakes according to your preference. For more spice and less heat in general, leave them out entirely. Cut the cauliflower into bite-sized florets. I like to go smaller so they roast at about the same rate as the chickpeas, which take only 20-25 minutes. Toss the florets with some olive oil, and a little more than half of the shawarma seasoning, then spread onto a baking sheet. Roast ’em until they’re golden brown and crispy, and bite tender. I consider them “perfect” when I can easily pierce the stem with the tip of sharp knife. 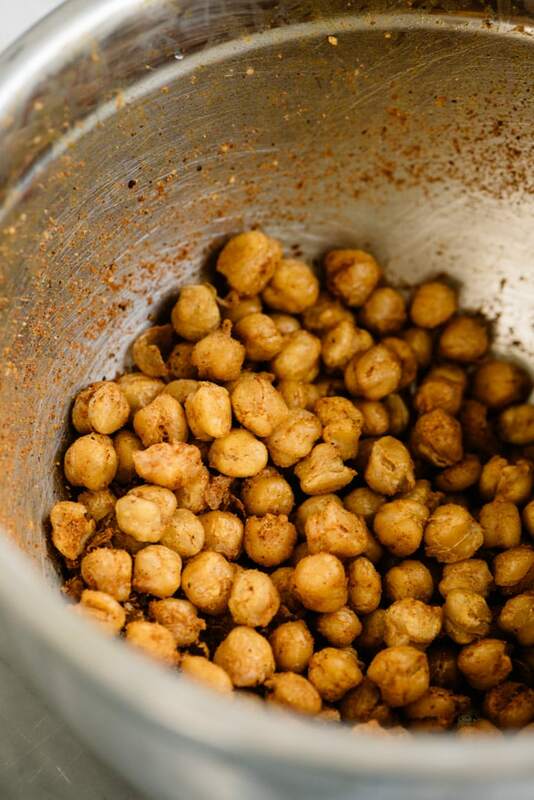 Rinse a drain a can of chickpeas, then dry them really well. The drier they are, the crispier they’ll get. 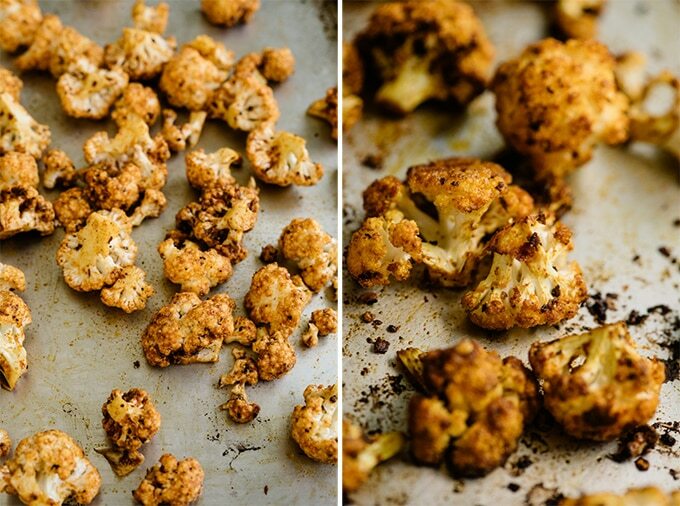 Toss them with some olive oil, spread onto a baking sheet, and pop them into the oven along with the cauliflower. Roast for 20-25 minutes, or until they’re browned and crisp. Remove from the oven, and toss with the remaining shawarma seasoning. I prefer canned chickpeas for this recipe because they crisp up better. My from-scratch chickpeas are always too soft for roasting and crisping. While the cauliflower and chickpeas are roasting, whip together this super simple cucumber tomato salad. 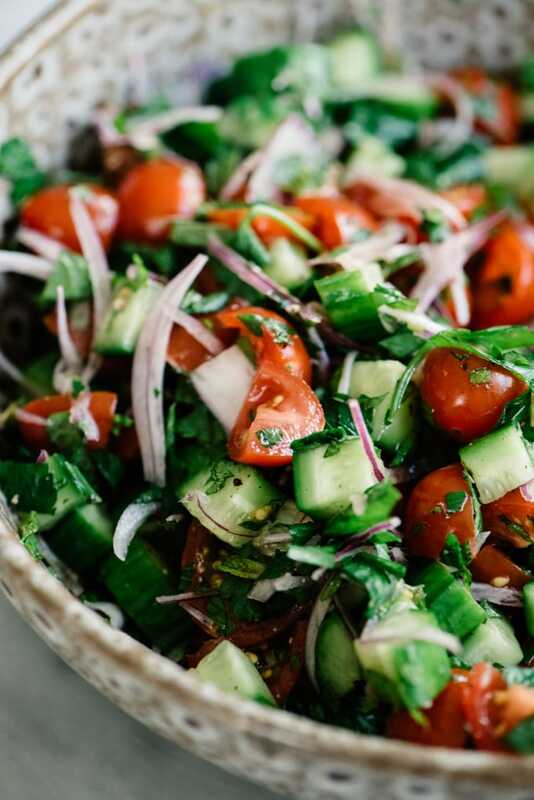 Diced persian cucumbers, quartered cherry tomatoes, super thin red onions, mint, and parsley. That’s it. Maybe a bit of extra pepper if you’re feeling spicy (I did cuz I was). Toss it, set it aside. Layer about half a cup of quinoa (or your favorite grain) in the bottom of a bowl, then top with a quarter of the crispy chick peas, a quarter of the roasted shawarma cauliflower, and a quarter of the cucumber tomato salad. Drizzle with tahini dressing to taste, and serve immediately. Don’t feel limited to quinoa, use any grain you love! Couscous, brown rice, quinoa, millet, farro or your favorite grain will work perfectly. This recipe translates to a meal prep bowl SO WELL. Layer the quinoa, chick peas, and roasted cauliflower in a meal prep container. I love meal prep containers with removable compartments for recipes like this, where you’ll heat one portion, but keep the other portions cold. Place the cucumber tomato salad in a second, smaller container, and the tahini dressing in a third. When you’re ready for lunch, heat the quinoa and veggies for about a minute, then top with the tomato salad and tahini dressing. You’ll be the envy of every co-worker within sniffing distance. 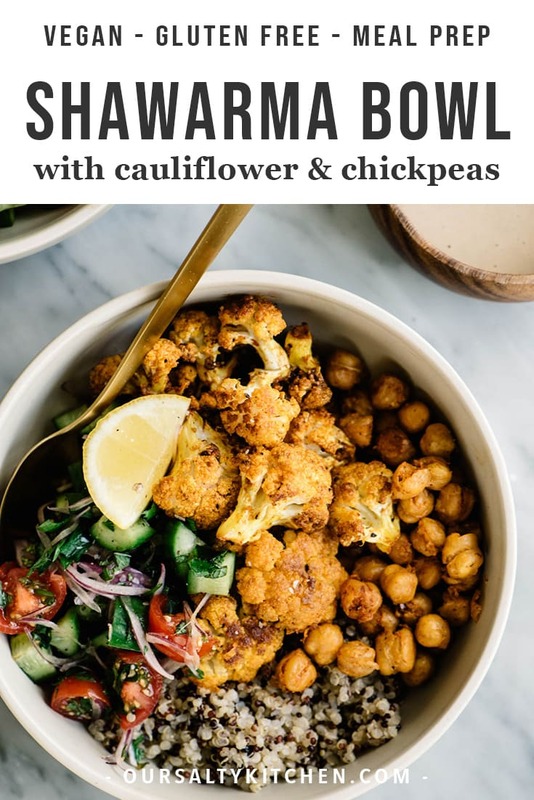 If you love this vegan shawarma bowl, you’ll love these super flavorful vegan, vegetarian, and/or gluten free meals too! 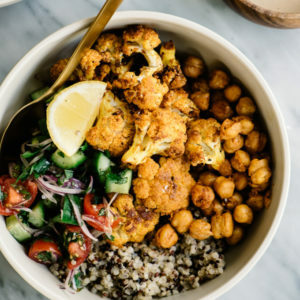 DID YOU MAKE THIS CAULIFLOWER SHAWARMA BOWL? I WANT TO SEE YOUR CREATIONS! SNAP A PICTURE AND SHARE IT HERE ON PINTEREST. Please don’t be intimated by the recipe length. 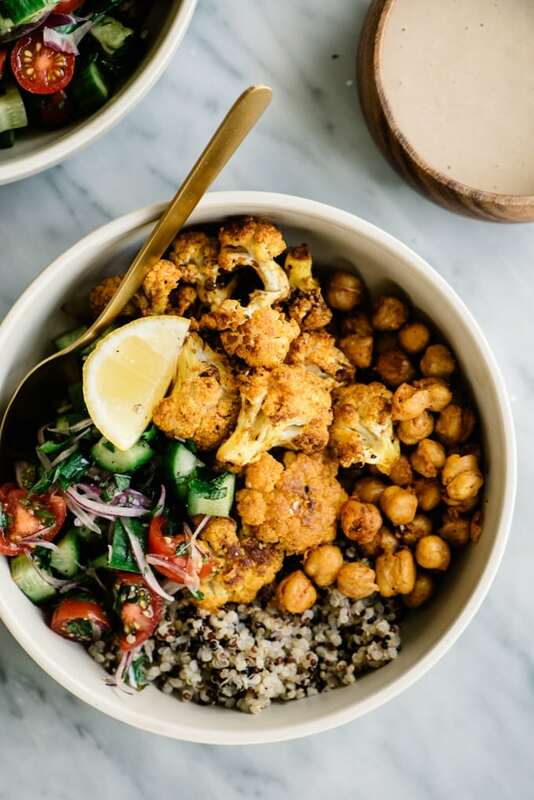 This cauliflower shawarma bowl is super duper easy, but it does take a few steps to get there. Fair warning that you’re gonna have some dishes. Sometimes it’s the price you pay for flavor friends. Heat the oven to 400*F.
Rinse the quinoa, then place into a small pot. Cover with 2 cups water or broth and add ½ tsp salt. Bring the liquid to a boil, then reduce to a simmer, cover, and cook for 15 minutes, or until all the water is absorbed. Turn off the heat, and keep covered an additional 10 minutes. 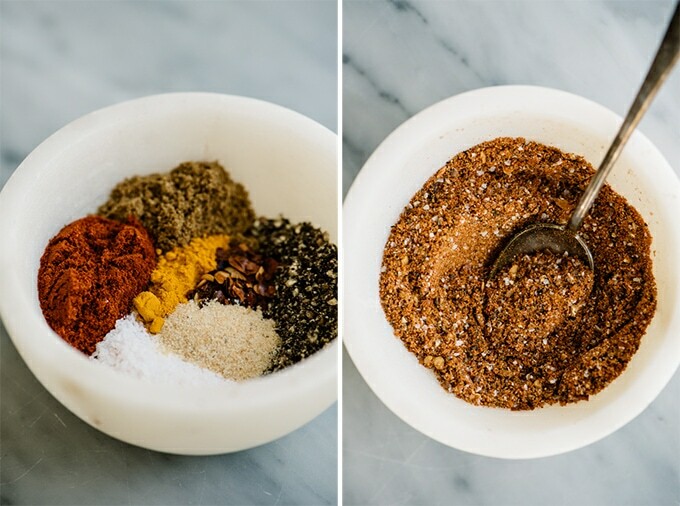 Mix the shawarma spice blend until all ingredients are evenly distributed. Rinse, drain, and dry the chickpeas. Be sure to dry thoroughly with a cotton kitchen towel or paper towels. Toss with 1 tbsp olive oil, then spread onto a baking sheet. Toss the cauliflower with the remaining tablespoon of olive oil and just over half the spice blend. Set the remaining spice blend aside to use later. Spread the cauliflower onto a second baking sheet. Place the baking sheets in the oven and roast, rotating once halfway through, about 30 minutes total. The chickpeas are done when they're golden browned and crisp. The cauliflower is done when you can easily pierce the stems with the tip of a sharp knife. While the cauliflower and chickpeas are roasting, make the tomato cucumber salad. 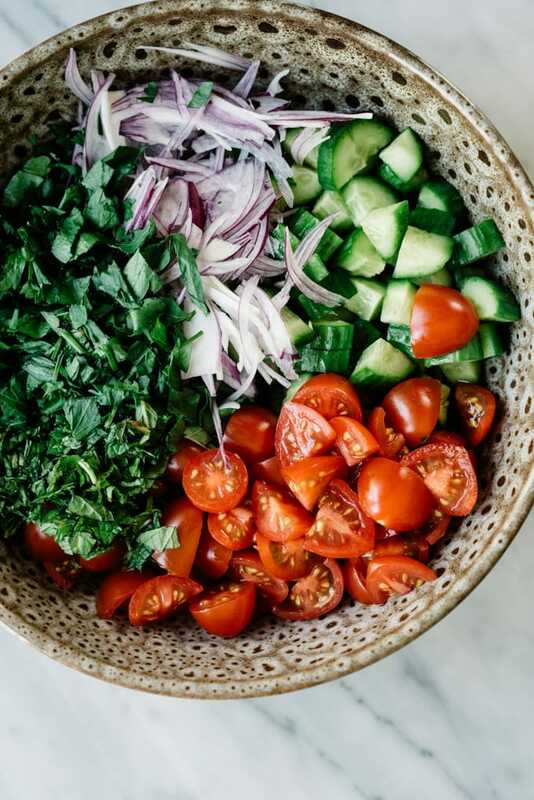 Place the tomatoes, cucumbers, red onion, mint and parsley in a small bowl, season with ½ tsp salt and ½ tsp pepper and toss. Remove the chick peas from the oven and toss with the remaining spice blend and lemon zest. Remove the cauliflower from the oven and sprinkle with the lemon juice. Assemble the shawarma bowls. Divide the cooked quinoa between 4 bowls. Top with one-quarter of the chickpeas, one-quarter of the cauliflower, and one-quarter of the tomato cucumber salad. Drizzle with tahini dressing to taste and serve immediately. Do you just use tahini sauce or what is the dressing? Thanks! Can’t wait to make this!! Looks delicious! Just fyi – couscous is pasta, not a grain. One of the best vegetarian recipes I’ve found. Simply delicious. I’m not a vegetarian, but am searching for and cooking more vegan meals for my vegan friends and relatives. I recently made this for a family get together for both my vegan and (mainly) meat eaters (had chicken as an extra for those who wanted to add it to their bowl). Itwas absolutely delicious and garnered rave reviews from everybody! Such a great blend of flavors. I can’t wait for leftovers tomorrow. I’m so happy to hear this Caryl! We’re trying to eat more plant based meals too, and this is also one of our favorites. This recipe is not Paleo. Couscous is a grain and chickpeas are legumes. Sounds really tasty, though, and I may use some substitutes for both. Yes, unfortunately the pin had a typo – paleo instead of vegan. Its been updated, but there are still some erroneous ones circulating on pinterest. I do have a completely paleo chicken shawarma salad recipe, so that might help you with the subs! Great recipe! Just made this for dinner last night. So good, even my little guys loved it! So glad you liked it Kristen! This looks yummy, but wondering if the nutrition facts are right…why is it 21g of fat? I’m wondering the same thing! How is this 500 calories?